In an effort to clean out our freezers for the upcoming gardening, chicken and turkey “season”, I have been making a lot of jerky lately. My kids love it, my hubby loves it, and the dog loves it as much as she can. Well, when no one is looking anyway. After all the canning of chicken, (you can read that here) making of soup for the pantry and broth galore, I needed to do something else with it. 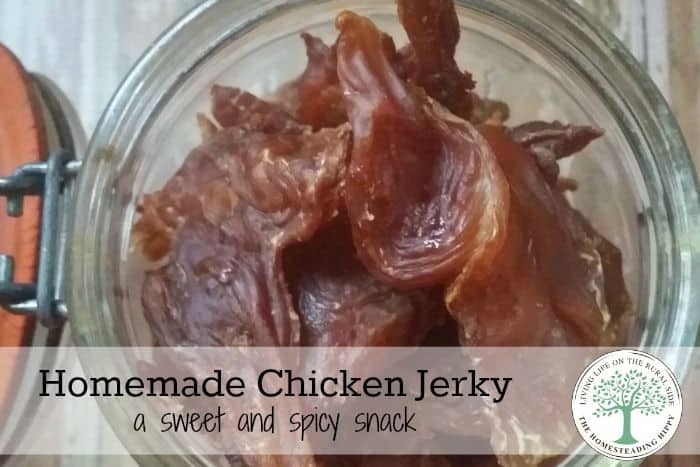 So, chicken jerky came to be in our home. When I am cutting up a whole chicken, I usually save the breasts for later meals. I also de-bone the thighs and use them like the breasts when I can. They are more versatile in recipes than the legs are, at least to me. So, it’s mainly leg meat I am using here. What you will need to do is cut very carefully down the leg meat and slice it in 1/2. Then, cut the main part of the meat off the bone. You will want to be using a very sharp knife for this, as it will minimize your risk of injury from it slipping. The leg meat has a lot of tendons, and you will want to make sure to take as much off as you can. This can easily be done with a sharp knife, and just cutting it as close to the meat as possible. Once you have your meat cut off the bones, stick the bones in some water and make some broth. Next, you will want to soak your meat in a marinade overnight. 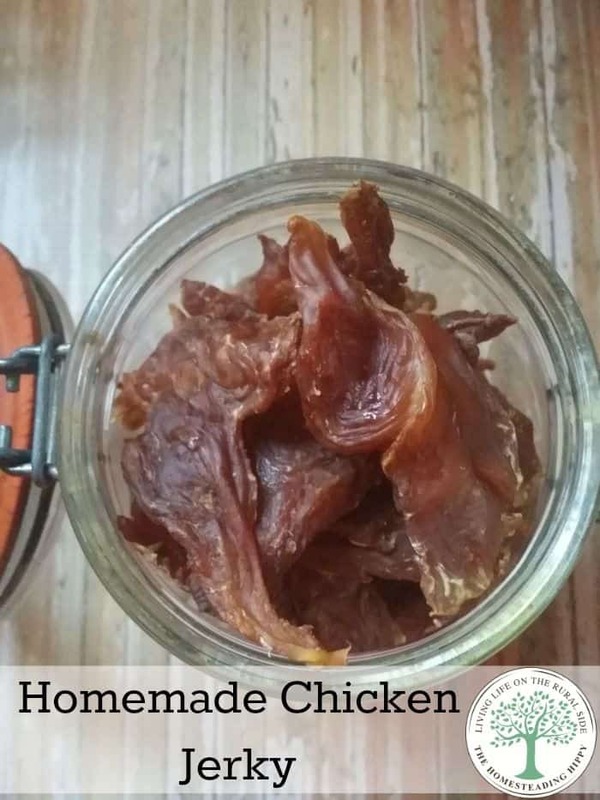 I used my father’s recipe for beef jerky, tweaking it some for chicken. Simply add all the ingredients in a large bowl, and toss the chicken in. Stir to coat all the pieces, and allow to marinate for 12-24 hours. simply remove them, and place them on a dehydrator sheet. You can find the one I use here and dehydrate on medium high (145) for 12-24 hours. You do NOT want to be sampling this until it’s fully dry, or the germs may not be all killed. This is a great time to add beef jerky that the kids won’t touch, by the way. After 24 hours, check the pieces. They need to nearly break when you bend them. This way, you know the water is all out. Otherwise, you risk mold. Store in an airtight container for up to 4 months. Honestly, though, I haven’t had a batch last longer than a week…it’s that good! Looks delicious. Aside from canning, would this be a good use for old hens? I’ve pinned for future reference :). i have the same texture with either the deydrator or the oven. Try turning your oven down a bit to see if that helps? My doggie has congestive heart disease can you make this not using salt or is that totally necessary? I know salt is used to cure meats keeping them longer but I need to avoid. Sorry, but 12-24 hours to make jerky is ridiculously long for jerky. 7-9 hours should be more than enough for most commercial dehydrators. You’re just wasting energy & time. Jerky should still have a bit of flexibility when it is done. Almost certainly after all the time you are suggesting, the jerky snaps in half if bent. It not do so. However, one should also keep in mind that the temperature & air circulation varies from tray to tray. I’m using 6 circular trays, which holds over 5 lb of the raw chicken, allowing some space between the slices. I flip them over and reverse the top to bottom order of the trays after 3 hours and again after another 2-3 hours and at 7.5 hours they are adequately dry. I do not put them in plastic bags until they have cooled completely because even the apparently dry chicken will still give of some moisture that will condense on the inside of the bag if not allowed to cool first. I use liquid smoke, because I like a smokier flavor, a bit of allspice (for a bit of true “jerk” flavor) and both black & red pepper (flakes) because I like it spicy, along with some sugar or molasses…NOT honey, which some people suggest, because that leave even the dry jerky sticky. I also use a touch of pink curing salt, just as an extra precaution. Not much is needed…1 tsp per 5 lbs is plenty. Several other comments: For a recipe like this, you should state the amount of meat to which you add your marinade. NO oil is necessary for jerky. 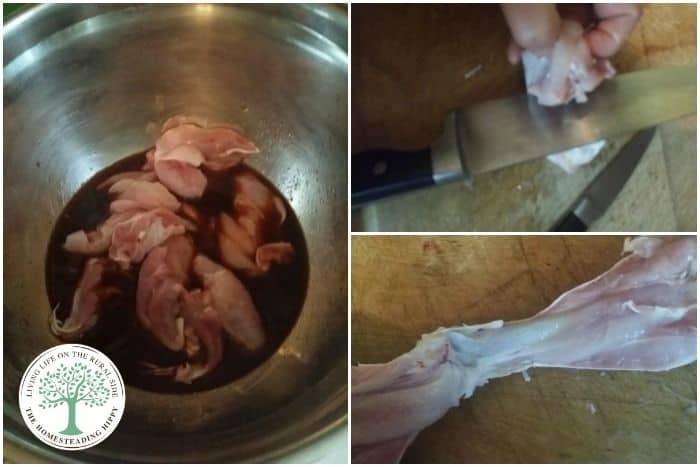 In fact, if it is not eaten quickly enough, oils OR visible fat in the chicken will become rancid. Finally, I think the amount of vinegar you suggest is too much. It’s so much that you will almost be pickling the meat. The vinegar should flavor the meat, not more than that. Sorry for being picky…but I’ve become such an expert on jerky that I eat it instead of cooking chicken most of the time! Can you send your recipe please? Is that time and temperature adequate to kill any germs, bacteria, etc? I went to a meat locker and bought some jerky spice. The butcher told me that the spice included some “cure” which is nessesary to kill germs since the meat will not get hot enough to kill the germs. The “cure” is sodium nitrate. Please tell me how to “cure” the meat if I don’t do it the way the butcher told me. Also, how important is this to do?